60-year-old woman after an upsetting argument with her daughter. List at least three things that can look like this. 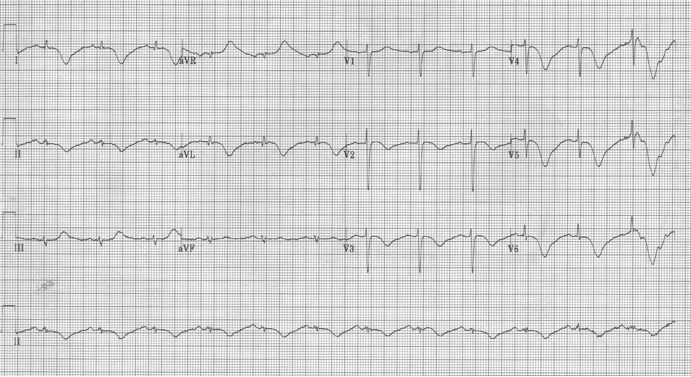 The differential diagnosis of conditions that produce inverted T waves is worth reviewing. It includes more than ischemia and subendocardial infarction! This woman presented with chest pain and shortness of breath after the stressful argument with her daughter. She was taken to the cath lab which revealed clean coronary arteries but left ventricular apical ballooning – Takotsubo cardiomyopathy. From the differential diagnosis, there are really only four things that can produce such striking, deeply inverted T waves: coronary vasopspasm, subendocardial ischemia, CNS events (stroke or subarachnoid hemorrhage), and Takotsubo cardiomyopathy. Prasad A, Lerman A, Rihad CS. Apical ballooning syndrome (Tako-Tsubo or stress cardiomyopathy): a mimic of acute myocardial infarction. Am Heart J 155:408, 2008.